The start of the 123rd Boston Marathon was delayed due to early-morning thunderstorms, but once athletes were given the green light, there were some surprising winners. The men’s finish was breathtaking, with 30-year-old Lawrence Cherono of Kenya out-sprinting two-time Boston winner Lelisa Desisa in likely the closest finish in the race’s history. The men’s pack stayed fairly tight through much of the race, though it whittled down a bit over the final couple of miles. 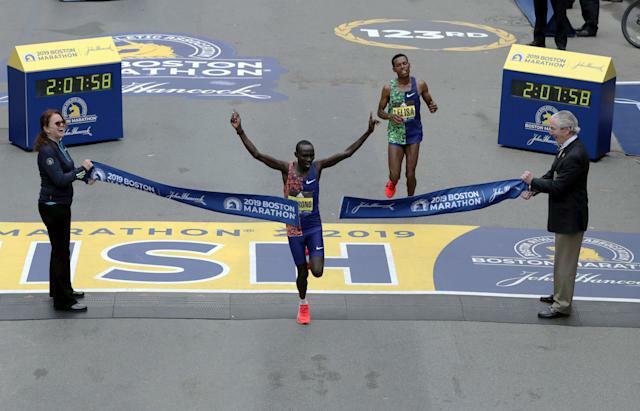 Coming down Boylston Street to the finish line in front of the Boston Public Library, Cherono and Desisa pulled away from Kenneth Kipkemoi, somehow able to sprint after running 26 miles. At one point it looked like Desisa put an arm out to try to stop Cherono, but Cherono would not be denied, winning in his Boston debut and posting his best-ever marathon time by nearly 10 minutes. His time of 2:07:57 is the fastest since Geoffrey Mutai set the course record of 2:03:02 in 2011. Scott Fauble, who calls himself a “burrito guy” on his website, was the first American man, finishing seventh in 2:09:08, his best time over the distance. Ethiopian Worknesh Degefa cruised to the win in the women’s race, taking the lead just four miles in and working up a massive lead. Her time was 2:23:31. Though runner-up Edna Kiplagat, the 2017 Boston winner, closed the gap over the final couple of miles, Degefa was ahead by so much — her lead was over a minute for a large stretch of the race — Kiplagat simply ran out of real estate to try to catch her. The 28-year-old Degefa came into Boston with the fastest career marathon time among the contenders, running 2:17:41 in a second-place effort in Dubai earlier this year. But Dubai is a flat course, unlike Boston, which is known for its hills. After having success at the half-marathon for several years, Degefa ran her first marathon in January 2017, also in Dubai. She won the race, surprising many. Jordan Hasay was the first American finisher; she is just returning after racing after 18 months away because of repeated stress fractures in her left heel, and finished third in 2:25:20. Defending champion Des Linden, the first American woman since 1985 to claim Boston, finished fifth in 2:27:00. Daniel Romanchuk, a 20-year-old student at the University of Illinois, became the youngest-ever winner in the men’s wheelchair division and is also the first American man to win in Boston since 1993. On his way to a nearly three minute win, Romanchuk beat wheelchair racing legends Marcel Hug and Ernst Van Dyk, who between them have 14 Boston titles. Romanchuk has already won the New York City and Chicago marathons, both last year, so he has now won the three major American marathons. In the women’s wheelchair race, Switzerland’s Manuela Schär won her second Boston title (her first was in 2017), besting five-time Boston winner Tatyana McFadden. McFadden and Romanchuk are training partners.